Last year, the Daily News covered the griping of Park Slope residents unhappy that a parking garage is being turned into condos. Luckily, the whining of a few petty individuals has not stopped the project’s progress, and thanks to a tipster, YIMBY can now reveal what the old garage will look like once its transformation is complete. The building, at 800 Union Street, will actually shrink in square footage during the process, with its initial 52,897 square feet being reduced to only 51,709 square feet. The latter figure will include 7,248 square feet of ground floor retail, with another 44,461 square feet divided between 28 condominiums, averaging a very spacious 1,600 square feet apiece. While large apartments are by no means a bad thing, these will likely sell for astronomical prices that would not be so inevitable if Park Slope were more accommodating to larger new developments. Parking lots and garages fall at the very bottom of the list of things that are good for New York City and its citizens, and if anything, the existing building’s conversion should be applauded (and the end-result should have been far larger, as well). In terms of appearance, the garage will dramatically improve. Parts of the old brickwork will be stripped away for metal accents, which will also crown the refurbished structure. 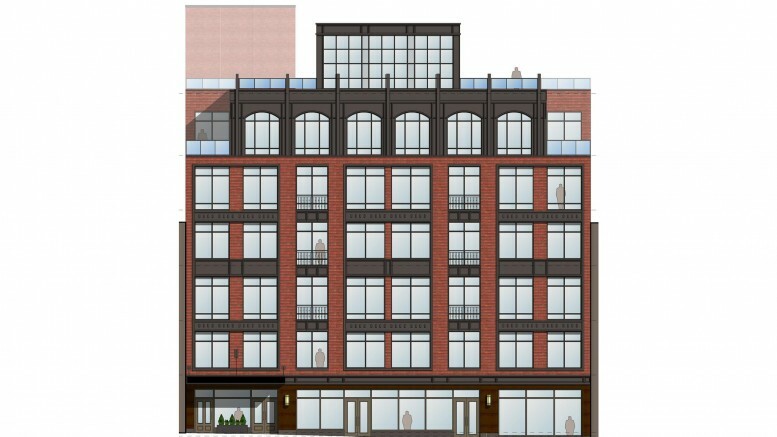 Most importantly, the first floor will yield to retail space, further enlivening a block that is also home to the Park Slope Food Coop. Job applications list Christian Zambrano of Sibertekture as the architect, and per the Daily News, Lewis Meltzer is both the owner and developer.